Hospitals have overspent by £886 million in the first nine months of the financial year, according to the regulator. While the deficit is down from the record overspend of £2.45 billion in 2015/16, the health service is expected to end the year with a deficit far larger than its target of £580 million. NHS Improvement said 135 out of 238 trusts were in deficit after nine months. The figures cover hospitals, ambulances, mental health units and community services although most of the deficit came from hospitals. Trusts were experiencing “one of the most challenging winters on record due to a huge increase in the demand for urgent and emergency care”, it added. There were 5.34 million patients attending A&Es between October and December — 200,000 more than the year before, and a 3.5 per cent increase in the number of patients requiring further treatment in hospital. A 28 per cent increase in delays in discharging medically fit patients because of shortages in community or social care were adding to the pressures, the organisation said. “This intense demand for emergency treatment coupled with a significant reduction in bed availability has led to providers collectively underperforming against several key national healthcare standards, and having to postpone some planned care,” NHS Improvement said. The forecast deficit for the NHS for this financial year is now £873 million. For 2015/16, the overall budget was around £116.4 billion. Jim Mackey, chief executive of NHS Improvement, said: “NHS providers are treating more patients than ever before, which is a tribute to the hard work and commitment of their staff. 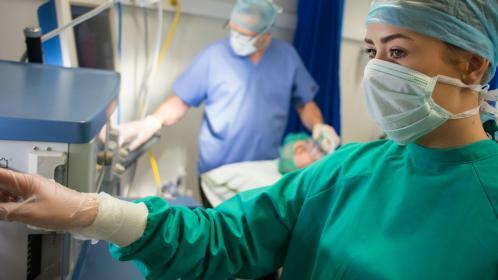 NHS Providers, which represents hospitals, said that trusts were relying heavily on one-off savings that could not be made in the future. A survey of 99 NHS finance directors found that while most trusts were on or ahead of target for spending, just over a quarter (27 per cent) reported deteriorating finances. Two-thirds said they can only meet targets this year as a result of one-off savings, estimated to be as much as £1 billion. Chris Hopson, the chief executive of NHS Providers, said: “Trusts spent more than they planned and lost income from cancelled operations — both were needed to create the extra bed capacity to meet record emergency winter demand. Niall Dickson, chief executive of the NHS Confederation, which represents health service organisations across England, said the immediate priority should be additional funding for social care. He said: “This is a system that is letting down more than one million elderly people who are not receiving the support they need. “The result is overstretched hospitals having to cope with too many admissions and too many patients unable to be discharged.